That bit of holiday between Christmas and New Years day and up until I go back to work, is such a lovely time for me. 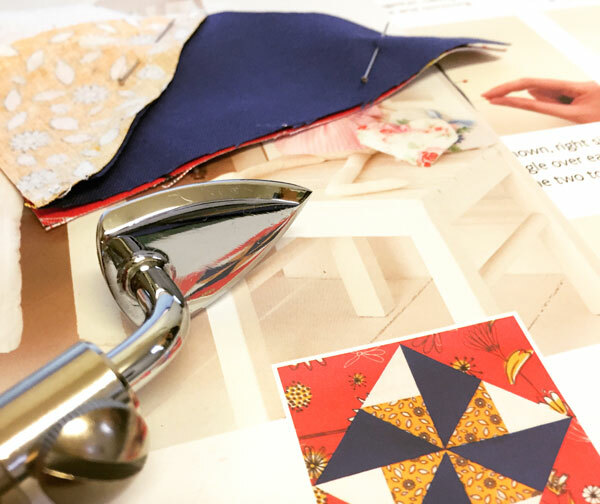 I don’t like to make too many plans so I can have optimum time for sewing and baking and general pottering – all the things I wish I could be doing when I’m working! This time round I managed to complete two tops. One yet to be photographed and blogged (after the heavens have closed) and one sadly not-up-to-scratch Burda top. That wasn’t an Ablogogie btw! I’ve also just managed to get in a bit of quilt blocking. 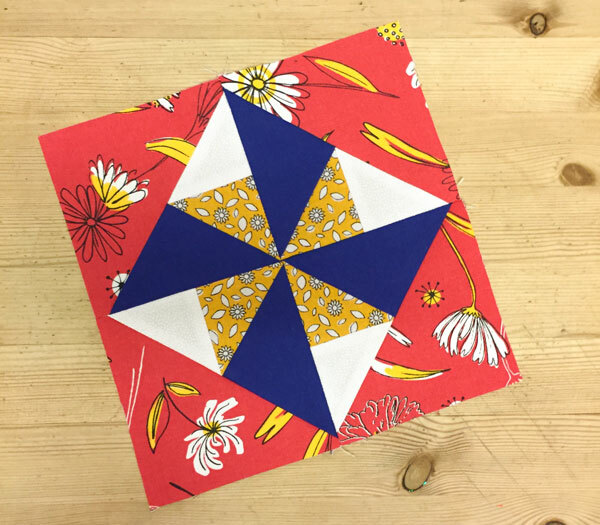 I’ve been tricked into thinking I have all the time on my hands now, much the same as I did this time last year when I last made this Churn Dash quilt block! My great-great-grandchildren are so going to love this quilt! This one is block 26, a Windmill Square – a modern take on the Windmill block. The design also features within the Diamond Pinwheel and the Windmill Sails Block. Historically, the pinwheel is believed to be a good luck symbol, it’s movement suggesting the ebb and flow of fortune. I sometimes think I’m cheating by having the fabrics pre-chosen but I’m not sure I’d chose a better selection. All the designs have been perfect to date. The only real snag is that the fabric pieces supplied are just enough to cut your templates from and that doesn’t allow for any personal preference with placement. It always seems to work ok though. I loved getting my tiny iron back out of the basket and being able to focus on the small neat seams. And I love that this block is seemingly loaded with luck too! Luck that I will willingly and gladly share with you all. Because we could all use it from time to time! History: A modern take on the traditional Windmill or Double Pinwheel block. Thanks Charlotte. I must remind myself that it doesn’t actually take that long, compared to making a garment. Must up my game with quilting! Those points are expertly matched – trumpet blowing is definitely allowed. I ought to get one of those tiny irons really, it does seem a bit of overkill using a normal one. Can you recommend the one you use? Points are realy hard so you should be proud. I like all kinds of sewing (yes, even mending!) but I really love making quilts. Thanks for the good luck, feel like I need some at the moment. Cute little square. Hope you feel enthused to make another one soon. Previous PostPrevious Burda cap-sleeve top and a bit of a whinge-up!